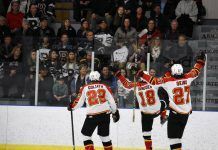 Let’s have a tip of the hat and a whole bunch of stick taps for Bruno Campese, the general manager of the Prince Albert Raiders. players, but you wonder how many of them would have done something that Campese did just the other day? Kris Schmidli, who is from Zurich, Switzerland, recently had a conversation with Campese. Schmidli, who is preparing for his 19-year-old season, had received a contract offer from a pro team in Zurich. Oh, what to do? After talking with Campese, Schmidli signed with the GCK Lions, a team that plays in his hometown of Zurich. The Lions play in Switzerland’s National League B.
Campese is to be saluted for his honesty. Because while Schmidli, who is 5-foot-10 and 180 pounds, may never play in the NHL, he would have been a key part of the Raiders in 2015-16. Campese acquired Schmidli as part of the deal in which F Leon Draisaitl, the German star, was sent to the Kelowna Rockets. 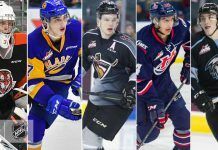 That deal was forced on Campese because the Edmonton Oilers, who hold Draisaitl’s NHL rights, refused to return him to Prince Albert and let it be known that they wanted him in Kelowna. Campese dealt Draisaitl, who had put up 105 points, including 38 goals, in 64 games in 2013-14. This season, in 32 regular-season games with the Rockets, Draisaitl had 53 points, 19 of them goals. 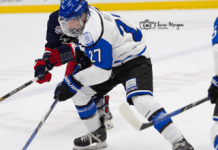 Along with Schmidli, Campese acquired D Dalton Yorke, who will be 19 next season, a 2015 first-round bantam draft pick, a fourth-round pick in 2016 and a conditional fourth-rounder in 2016 or 2017. Injuries limited Schmidli to 17 games with the Raiders, but he was a point-a-game producer. He didn’t play between Feb. 4 and March 14 as the Raiders battled for their playoff lives, a fight they eventually lost. All told, Schmidli put up 34 points, 12 of them goals, in 50 games this season. One season earlier, as a freshman, he had 35 points, nine of them goals, in 68 games with Kelowna. You can bet that when the deal was made Campese saw Schmidli as a big part of next season’s team. Instead, Campese will go into the CHL’s 2015 import draft with an opening. The Raiders’ other import is Czech F Simon Stransky, who won’t turn 18 until Dec. 21. This season, as a freshman, Stransky had 42 points, 12 of them goals, in 70 games. D’Andrea’s complete story is right here.